Ah, camping! Each day of Guru-guru Camp is easy, relaxed and very lightly structured. We’ll start each morning with 15-30 minutes of hoop drills to strengthen and tone our hooping bodies. 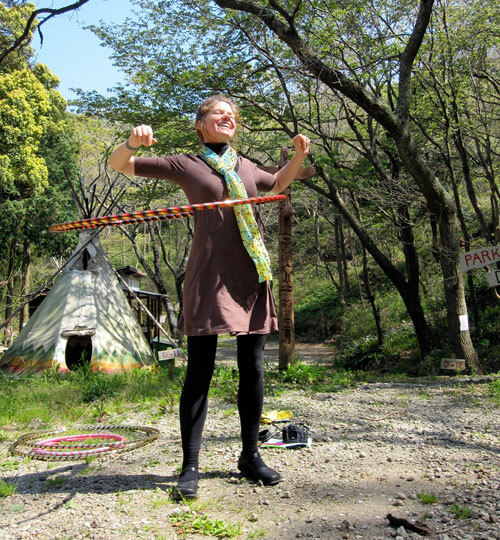 Before lunchtime, Tink will lead a 60 minute hoop workshop. In the afternoon, there’s plenty of free time or maybe another workshop or group activity before the sun sets, depending on our mood. You are invited to teach a workshop, lead an activity, or offer services of any sort. Share your talents and skills. Simply write your session on the schedule at the Guru-guru Camp HQ when you arrive. Fri 4/29 AM: Arrival. PM: Hoop Drills Introduction. Sat 4/30 AM: Hoop Drills. Original Hoop Trick. Sun 5/1 AM: Hoop Drills. Hoop Games for World Laughter Day. Mon 5/2 AM: Hoop Drills. Hoop Dance Styles. Wed 5/5 AM: Depart for Tokyo.